If you didn't make it to the American Craft Council Show at Cobb Galleria last weekend, you totally missed out! May I recommend following them so that you're in the loop for next year. The Show was nothing like your typical "craft" show...it was filled with artists! Showing and selling high-end art, jewelry, furniture, and fashion—what I would call fashion art, much of looking like the fabulous designs on Project Runway!—the Show was basically a full-scale convention. It was so much more than what I had imagined. Before I go further, I'd like to thank the American Craft Council Show for the tickets to attend the Show. I won them in a Facebook giveaway via the Museum of Design Atlanta (MODA), so "Thank you" to MODA, as well. 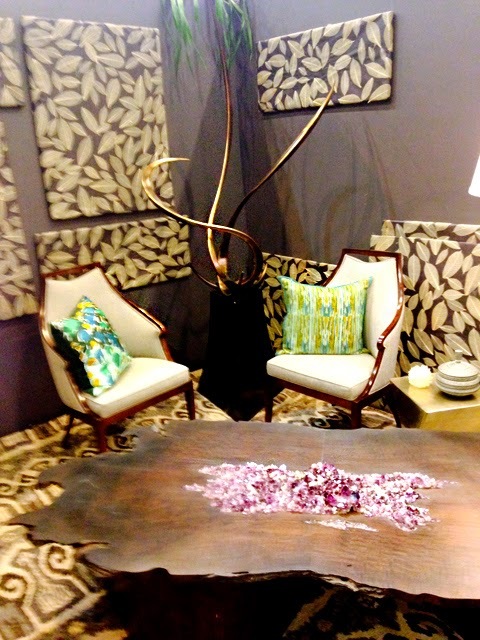 The Show also featured, in the middle of the showroom floor, a home decor exhibition, "Make Room Modern Design Meets Craft." The iPhone photos in this post are of that exhibition. 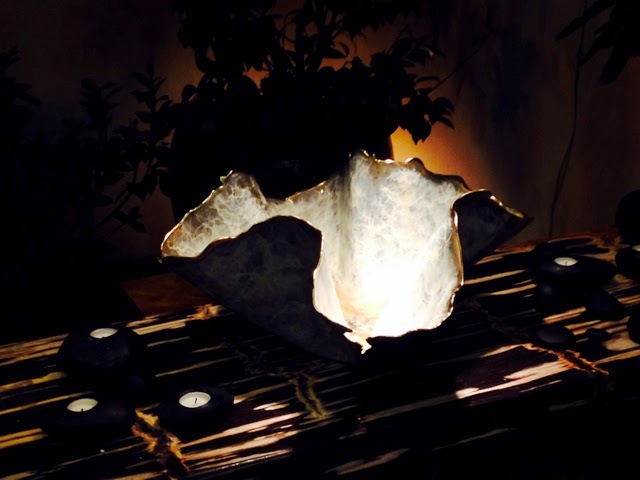 Among the featured artists was Mike Sluder of Mike Sluder Metalworks. I had the pleasure of meeting Mike at the "The South's Next Wave: Design Challenge" hosted by the Museum of Design Atlanta (MODA) in late 2012 and early 2013. Mike also had a booth at the Show where we stopped by and caught up for a few minutes. I absolutely love Mike's design aesthetic...his work is brilliantly awesome! Check it out here. The Show was held at the beautiful Cobb Galleria Centre, located near the stunning Cobb Energy Performing Arts Center. Parking was easy, entry was easy, navigating was easy...I was impressed with just how easy the experience was. I had not before met Kathleen Plate, but recognized her work immediately as having also participated in The South's Next Wave: Design Challenge hosted by the Museum of Design Atlanta (MODA). 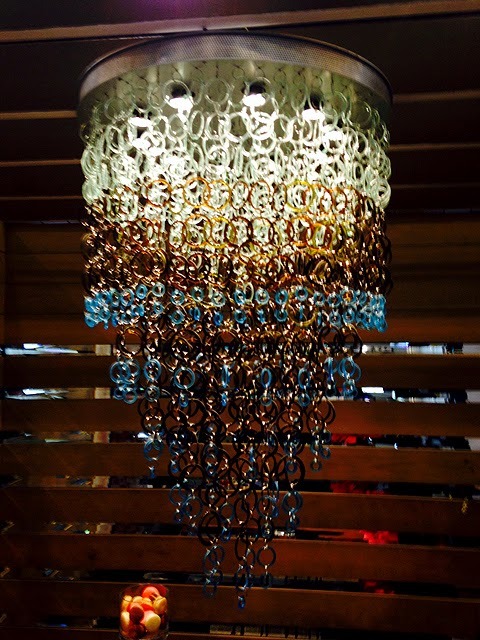 She too had a both that featured a chandelier similar to the one above, as well as a few pieces of her Smart Glass Recycled Jewelry collections. Don't let the word "recycled" scare you...Kathleen creates her own materials from recycled products and her art is stunning! Kathleen is engaging, charming, talented, and beautiful...and she's a new mom. Congratulations, Kathleen! The Show included some pretty awesome programming. There were quite a few demonstrations over the course of three days. Included in that programming was a demo by The Georgia Association of Woodturners, a pottery wheel demo by Callanwolde Fine Arts Center, a discussion on the "Craft of Puppetry" by the Center for Puppetry Arts...and that's just to name a few! There was also a tasting salon featuring "The Balvenie Handcrafted Scotch Whiskey Experience", a brand that several of my friends enjoy. There was really something there for nearly everyone...a great Show! 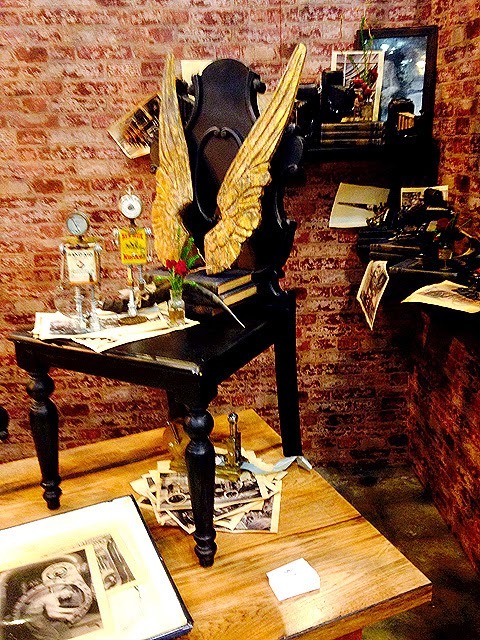 Of the center-floor designer booths, the one by David William D'Ambrosio of Redefined Home Boutique was by far my favorite, and would be a favorite of Steampunkers everywhere! And they're local—not too far from my office, in fact—so I'm looking forward to a studio visit before too long. There were more than 225 participants in this year's show, its 25th year in Atlanta, from all over the country. And there are American Craft Council Shows in other cities, so if you're traveling, check out their website to see if their next show is near your destination. Keep the American Craft Council Show on your radar for next year...I think you'll be glad you did!